A Muddied Murder by Wendy Tyson, a Mysterious Review. Review: Megan Sawyer has left her legal career in Chicago to return to her hometown of Winsome, Pennsylvania to take care of her mother and take over running the family farm, Washington Acres, once rumored to have sheltered George Washington during the Revolutionary War. Her objective is to open a café and store in town to feature the organic products of her farm, but Simon Duvall, the county commissioner, is throwing up roadblocks in every direction. When he is found dead in an old barn on the property, she knows she's the prime suspect in his death, in A Muddied Murder, the first mystery in this series by Wendy Tyson. But it turns out the rules Simon didn't have quite the authority that he thought and within days of his death, the acting commissioner issues Megan her permits. While the police conduct their investigation into Duvall's murder, Megan moves forward with opening the café and store. She's troubled that the barn is still a crime scene, but is determined not to let it distract her. 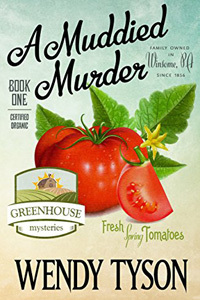 It isn't until Duvall's mother Lenora, an academic historian intent on designating the area around Washington Acres for historic preservation, is attacked and nearly killed, that Megan realizes her farm holds the key that connects the two crimes, and if she's going to keep the family homestead she needs to find out who is threatening it. There is much to enjoy in this first in series mystery. The characters are well-drawn and engaging, the setting well-established, and for those readers that look forward to pets, particularly dogs, making a difference in the outcome, there's a treat for them, too. (Megan's love interest is the local veterinarian.) The murder mystery plotline is a little over-complicated, in part because of tangential family relationships that seem at the time to be more important to the story than they really end up being. But the lead-up to the exciting denouement is well-handled and most — but significantly not all — of the plot threads are sewn up nicely in the end. The primary unanswered question for readers is an intriguing one, and will no doubt play some role in the next book. Overall, A Muddied Murder is a fine start to this series. Acknowledgment: Henery Press provided an ARC of A Muddied Murder for this review.